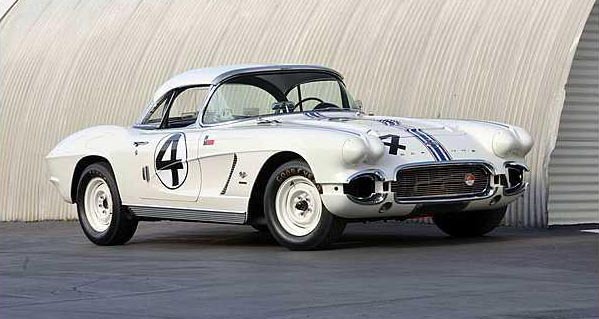 On January 12, 1962, a new Ermine White Corvette moved off the assembly line loaded with every racing option available, including the new fuel-injected 327 engine, a four-speed transmission, Positraction and RPO 687 heavy duty suspension and brakes that were crucial to its success on the track. Johnson flew to St. Louis, took delivery of the new Corvette and drove it back to Dallas to break it in. Once there, Johnson and his mechanic Bill Goodfellow prepared the car for competition, blueprinting the engine, fitting a roll cage and lap belt and stripping all unnecessary weight. They also added the contents of a crate that had arrived at Johnson Chevrolet soon after the Corvette, including a 37.5 gallon fuel tank, aerodynamic headlight covers, a louvered hood insert, front sway bar and plexiglass hood deflector. Together known as the “Sebring Package”, the extra goodies prepared the car not only for the grueling Florida endurance races at Daytona and Sebring, where it won 3rd in class, but the entire fifty-week racing calendar. At season’s end, as he always did, Johnson returned the car to stock and put it on his Dallas lot, where it was purchased by Jeff Sandlin, who raced the car infrequently for 12 years. By the time Sandlin sold it to Michael DuPre in 1976, the car’s history had been forgotten, so when DuPre took it to the Nabers Brothers in Houston for a fresh coat of Honduras Maroon, Ken and Gary Naber assumed it was just another early-sixties Corvette that had seen some racing action. Then one day the Nabers took notice of a photograph in Karl Ludvigsen’s book Corvette, America’s Star-Spangled Sports Car, showing Delmo Johnson’s Corvette at the start of the 1962 Sebring 12 Hours. Its unique five-stripe paint scheme was something the Nabers had seen once, and only once, before: behind the rear license plate bezel on DuPre’s ’62 Corvette. DuPre and the Nabers re-examined the car and, after careful research, determined that it was the same machine appearing in the Sebring photo. Another historically significant Corvette racer had surfaced. After driving the car for another five years, in 1981 DuPre informed the Nabers of his interest in selling the car. Coincidentally, vintage racer and Corvette collector Rich Mason had been searching for a ‘Vette with a racing history; the Nabers introduced Mason to DuPre, and soon thereafter the car was in Mason’s caring hands, undergoing a restoration to its 1962 Sebring configuration. The exterior was returned to its Johnson livery, and the engine rebuilt and refitted with the original Rochester fuel injection unit. Mason left the remainder of the car as it was, largely unchanged from its original race-ready state, as it remains to the present. The Johnson/Morgan Sebring Corvette became a popular fixture at vintage racing events up and down the West Coast at Monterey, Riverside, Portland, Seattle and other venues. In 1985 it was featured in Road & Track magazine, with Dan Gurney behind the wheel, in a comparison test between three contemporary cars and their early-sixties predecessors. In a moment of indiscretion that has since taken on the charm of a typical Gurney exploit, the All-American Racer launched the car into a massive burnout that resulted in slight contact with a vintage Ferrari also taking part in the comparison tests; the magazine’s editors assured Gurney that they would pay for repairing the minor damage to both cars, but not long afterwards, Mason received a letter of apology from Dan, along with a check for $500 (copies of both are now part of the car’s extensive documentation)! By today's standards, solid-axle Corvettes are among the poorest riding, least comfortable, and most ill-handling cars imaginable. All the same, a handful of individuals with the skill and the courage to tame the wild beasts actually went racing with them, and in so doing managed to blaze a trail through the record books at tracks around the country and around the world. As Corvette history buffs know, 1962 marked the debut of the 327 engine. Because the larger powerplant packed a lot more punch, the SCCA decided to move Corvettes up a notch into A-production. Older cars fitted with 283 engines continued to compete in B-production. Always on the hunt for greater speed and greater thrills, Delmo decided to replace the '61 he had been racing with a brand-new 1962 Chevy Corvette. Owing to his demonstrated skill behind the wheel and prior successes with Corvettes, Delmo had a close relationship with legendary chief engineer Zora Arkus-Duntov and enlisted his assistance with the new car. "It was easy," Delmo recalls. "I called Zora and said, 'Build me a race car.' The only other thing I said was to make it white." Zora knew exactly what to do, and in mid-January a gleaming Ermine White Corvette rolled off the St. Louis assembly line fitted with all available competition options. Included among these were fuel injection, a four-speed transmission, Positraction axle, a 24-gallon fuel tank, and RPO 687, the heavy-duty brake and suspension package that turned a normal Corvette into a capable-for the time-road racer. Delmo flew to St. Louis, took delivery of his new toy, and drove it back to his home base in Dallas. Once there he and Bill Goodfellow (the man Delmo describes as "probably the finest mechanic I've ever known") went to work on it. They performed all of the basic race car prep, including blueprinting the engine and drivetrain, installing a rollbar and competition lap belt, and removing the bumpers and other unnecessary, weight-adding parts. Delmo and Goodfellow also installed the contents of a wooden crate that arrived at Johnson Chevrolet a few days after the car did. Shipped from General Motors' Research and Development Center, the innocuous looking container housed what Chevy engineers dubbed the "Sebring Package." The Sebring Package consisted of an assemblage of parts designed to make Corvettes go faster and last longer in endurance road races. A louvered hood insert helped cool the engine compartment. A thin, contoured strip for the leading edge of the hood was intended to deflect debris away from the windshield. To further stiffen the suspension, a second front anti-sway bar and its mounting hardware were included. For the longer races, such as the 12-hour event in Sebring, an immense, 37-gallon, internally-baffled fiberglass fuel tank was supplied. And finally, contoured headlamp covers were provided to aid aerodynamics and protect the lights when they weren't in use. With essential preparations attended to and the much appreciated Sebring Package fitted in only a few short weeks, Delmo and his A-production Corvette headed into battle. Just as he did in 1961, Delmo again raced 50 weekends out of the year, including appearances at Daytona, Sebring, El Paso, Corpus Christi, Shreveport, Mansfield, and the Nassau Speed Weeks in the Bahamas. "If somebody had put an event together for Christmas and Easter I would have raced those too," he says with a broad smile. By the end of '62 he'd added a couple of dozen more class or overall wins to his resume, and chalked up another SCCA Southwest Division championship. As with most of his production racers, Delmo normally drove his '62 Corvette to the track, competed, and then drove it home again. And on more than one occasion he even used the Corvette to trailer another racecar to the event! Usually it was a formula junior that either he or his usual co-driver David Morgan would run the same weekend. "Pulling a trailer with the race car was a lot of fun," explains Delmo, "because it really pissed everybody off! Since Dave and I usually won, and because I was a Chevy dealer, the locals thought we were getting factory help and they couldn't compete. That's when we started driving the race car to the races instead of trailering it. And using it as a tow vehicle just rubbed it in their faces!" Aggravating the competition was always part of the fun for Delmo, and he constantly found new methods for doing it. "We brought a screwdriver, a pair of pliers, two quarts of oil, and a case of beer," he remembers. "That would also really piss them off! On those few occasions when we'd break down at the track we would borrow or buy enough parts to get home. I was always a fair mechanic, so I could fix whatever happened." As was his habit, Delmo sold the '62 at the beginning of 1963 to make way for a new Corvette racer. The old car went to Jeff Sandlin, who raced it off and on over the next 12 years. By the time Sandlin parted with the car in 1975, it looked like a typical tired old Corvette. It changed hands a couple of more times until coming into the possession of one Michael DuPre in 1976. By that time the car's important early history had faded away and nobody suspected there was anything special about it. After doing some work on the car himself, DuPre brought the deteriorated '62 to brothers Ken and Gary Naber, noted Corvette restorers with a shop in Houston. The Nabers were contracted to paint the car Honduras Maroon, and in the course of doing so they noticed a number of competition-inspired modifications. Of course, there's nothing particularly unusual about, that since many Corvettes of the era saw occasional track duty and were fitted with rollbars and the like. But still, the car and its modifications stuck in their memory. Some time after completing their work on the '62 the Nabers were perusing Karl Ludvigsen's excellent book Corvette, America's Star Spangled Sports Car, when a photo taken at Sebring in 1962 caught their attention. 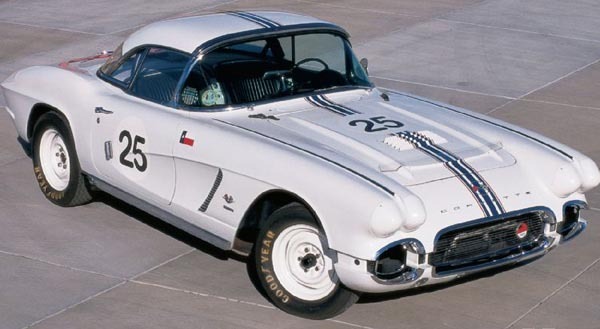 Most Corvettes competing in the '50s and into the '60s were painted in America's international racing colors, white overall with full-length blue stripes. One of the cars seen at Sebring in '62, which raced as #4 that year, had the typical paint scheme but with an unusual variation. A relatively broad blue stripe was in the middle with a narrower blue stripe on either side. Immediately adjacent to the two narrower stripes were two very narrow red stripes, for a total of five stripes. The Nabers immediately recalled that the remnants of the very same arrangement was beneath the rear license plate bezel on the car they painted for Michael DuPre. Could DuPre's car be the Johnson/Morgan Sebring competitor? A call to DuPre and some diligent research into the car's past revealed that indeed it was. Secure in the knowledge that he had a rare piece of Corvette history, DuPre continued to enjoy the car for several more years. Then in 1981 he mentioned to the Naber brothers that he would like to sell it. Shortly thereafter, noted vintage racing enthusiast and Corvette collector Rich Mason happened to call the Nabers to ask if they knew of any cars with good race history that were for sale. Mason was something of a regular at the Monterey Vintage Races held in Laguna Seca and noticed the scarcity of Corvette entrants there in 1979 and '80. He intended to rectify that with the purchase of a high-quality vintage Corvette, if he could locate one. The timing was perfect and the Naber brothers put Mason in touch with DuPre. In short order the two struck a deal, and Mason dispatched a friend to Houston to pick up the car and drive it to Nevada. Though it had seen hard use on racetracks around the country, the old warrior was in remarkably sound, original condition, having traveled only 29,919 miles since day one. As Rich Mason tells it, his friend's long drive back to Nevada was uneventful and in one respect even rather comical. "The return trip required only three fuel stops, as the 37-gallon gas tank was still with the car. The gas station attendants could not believe the car could hold so much fuel, and at each stop the attendant tried to figure out where it was all going!" After taking possession of his new prize Mason had the exterior stripped and restored to its initial race appearance. He also rebuilt the engine and fuel-injection system in preparation for the vintage racing he planned to do. Most of the rest of the car, including the interior and chassis, were left alone. These areas remain original and in excellent condition, with a beautiful, mellow patina. In the ensuing years Mason actively campaigned the car in vintage events, making appearances at Riverside, Portland International Raceway, Willow Springs, and elsewhere. Last year the old Sebring racer found a new home with another noted Corvette collector. Mason was reluctant to part with the car, especially after owning it for 18 years, but concluded that it deserved more attention than he was able to devote to it. "This is a beautiful car with a great racing history," he explained shortly before selling it. "It should be shown and raced so Corvette enthusiasts can see it. Between family and business obligations I'm limited in how much I can do. When I have displayed or raced a car in the last few years it has always been one of the other cars I own." Today, nearly 40 years after it was built, Delmo Johnson's '62 Sebring racer is still going strong. It very well may be as poor riding, uncomfortable, and ill-handling as it was to begin with, but the car is also just as beautiful, exciting, fast, and captivating as it ever was.